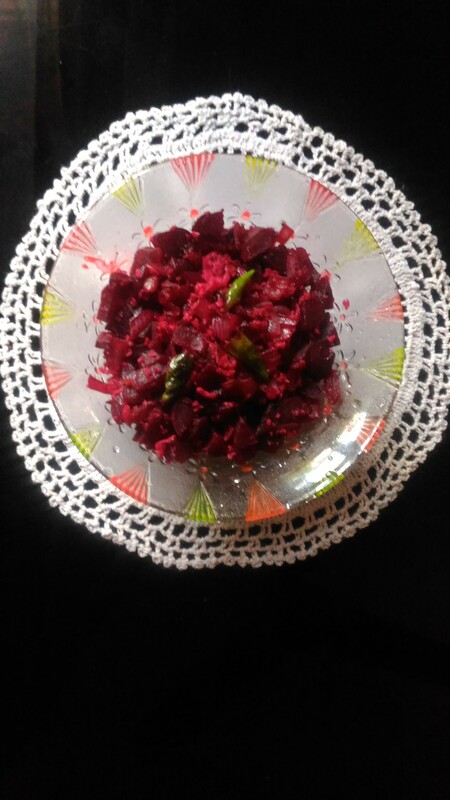 Another stir fry for vegans from me.Easy to prepare.Beetroot is not only attractive but also very rich in nutrients. 1.Peel beetroot and keep in pressure cooker for two whistles.When cool cut into small pieces.Keep aside. 2.Heat a pan.Add oil to it .To it add mustard seeds.when it splutters add urad dhal. 3. Add curry leaves and chopped onions or shallots with green chillies. 4. When done add cut beetroot mix well then add salt and finally coxnut scrapings. Goes well with sambar as well as curd rice. Another variation is can grind coconut with green chillies and 1/4 TSP cumin seeds and instead of adding coconut scrapings add this grinded mixture. 1.When a drain is clogged with grease put a cup of salt and a cup of baking soda into the drain.Then poura kettle of boiling water.This will remove grease. 2.Attached blouse pieces which come with sarees cannot be used.These blouse pieces can be used for stitching small pouches. 4. If children draw with wax crayons can blow with hair drier when it starts melting canrub it off easily. 5.After using fevicol put few drops of water in it and store. 6.If going to work that is paint or embroidery first wash and then draw the design and start working. 7.For drawing kolams on tile floors we can use children’s crayons. 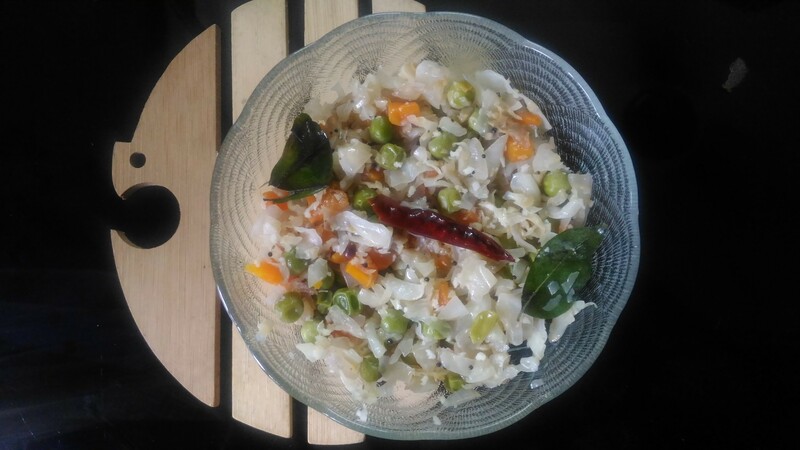 An easy recipe with few vegetables.This stir fry can be done quickly.Basically a mixed vegetable thoran.It is nutritious and delicious dish.it can be done with a variety of vegetables here I have used cabbage,peas and carrot. Shallots ___few or onion finely chopped. In a pan first put oil. Mix well and add salt and finally grated coconut to it.it is ready. This is served as a side dish for lunch or dinner with rice and some curry.the vegetables can be chopped ,diced or grated. Another option is that can add vegetables without boiling and fry sprinkling water and dry fry it with a generous àmout of coconut.